Took the old 8wt IMX for a little LMB fishing this morning. Had a large bass, at least 5#, come up and grab a frog popper and then immediately turn back to the depths. I strip striked and then lifted rod into the air and heard a snap. Tip section broke between tip and first snake guide but I was not high sticking given how far out the popper was when hit. If anything, the stress was several guides lower if there was any. Anyway, clean break though at an angle front to rear. This rod has been used in the past with bead head nymphs and tungsten head streamer so it might have been nicked at some point. 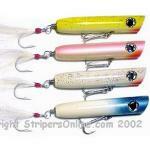 Anyway, I am original owner having bought the rod at Al Caucci's school in 1993. IIRC, the rods had a lifetime warranty at the time. I have not used it much in recent years and have kept it for old times sake. Took it out today with the Abel Big Game 1.0 I bought with it back then. Any thoughts on whether Loomis might honor a warranty on a 27 year old rod? My guess is they’ll take care of you. I think they will honor the warranty. As stonecipher said, keep us posted. Bummer on the rod breakage. I'm really fond of these rods owning several. The 2pc 9ft 9wt I have may be the best light weight / true 9wt saltwater fly rod ever produced. Regarding G Loomis and warranty issues on old rods .... about 3 or 4 years ago I broke (high sticking / not paying attention mistake) a much coveted 10 ft 6wt GLX fly rod. No longer made G Loomis via the expeditor program sent me an "equivalent" (not really) 10ft 6wt with only shipping cost to pay for the new unit. I'd expect the same treatment in your case ... let's know what actually happens. Thanks! About the same dollars today as what your IMX was new back in the day if I recall correctly. If you want something different like a NRX, see if they’ll work with you and maybe charge you a bit more then the Expiditor repair fee to upgrade.